after an extraordinary garden open mic last night at bloombars, featuring 16 year old Darian Jones, i hosted another packed house poetry slam at the fridge on capitol hill. the beltway poetry “slam of the union” included former DC/Baltimore Slam Team legends like Twain Dooley and Chris August, as well as IWPS and WOWPS contender Natalie E. Illum. 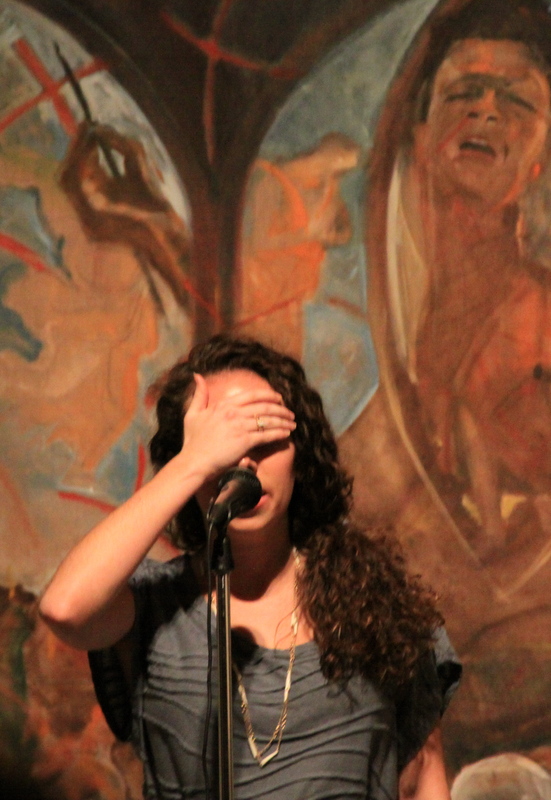 here is a pic of our “sacrificial goat”/calibration poet, Kim Sterin, a senior at university of maryland, college park who runs TerPoets, as she performs in front of a crazy awesome painting that’s part of the latest exhibit at the fridge. this was all after i had an early morning with the 4th and 5th graders at winston education campus in southeast dc sharing poetry and talking about marshmallows. i forgot to take a picture with the kids, even though i mentioned it aloud while speaking to them. but here is a pic of a present that one student gave to me. her name is Alexis, and she is a great young poet. she read me a poem of hers about music, and what she would do if she were music. It was beautiful and talked about angels. 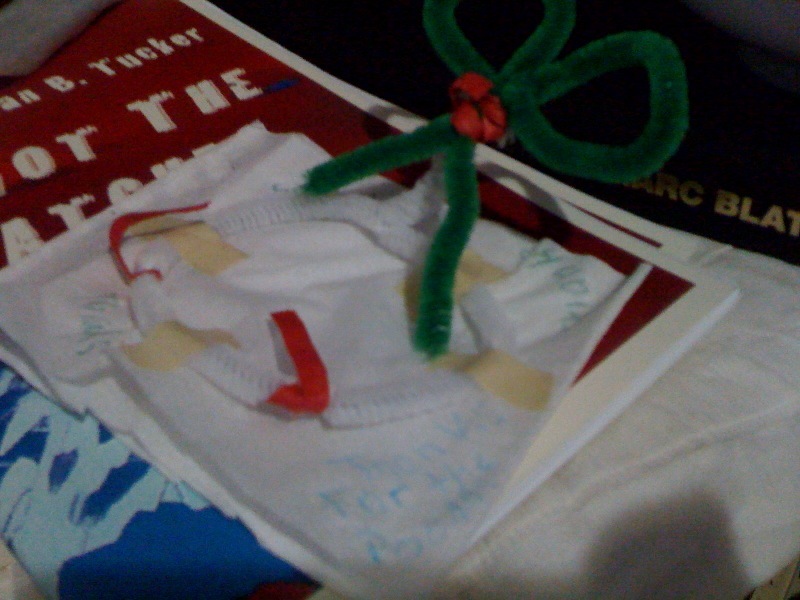 it appears to be a napkin with colored pipe cleaners arranged around it, with the words “thank you” and “thanks for the poetry” written on the edges. Alexis just came up and gave it to me after i finished performing. then she and some other students in her class read their poems for me. this was all before 11am. what a great morning though. the students had a warm up activity involving marshmallows. no joke. they each got a handful of marshmallows to eat and play with after describing. holding them led to squeezing them, led to sticky marshmallow goo over everyone’s hands. this one adorable student, Malik, managed to cover his entire hand in marshmallow. it soon found his face and made for a quite entertaining scene. i will take a picture next time. Malik said he’d be cool with it. i had a really good time in Ms. Burton’s class today. i’ll go back soon and take pics with the young poets there.